A Little Dab Will Do Ya’! Sometimes the thinking if little bit is good, more is better doesn’t quite work out as this group of would be Bank Robbers found out the hard way! Suspected robbers in Germany appear to have miscalculated the quantity of explosives needed to blow their way into a rural bank. The building housing the bank in the northern village of Malliss was largely destroyed by an overnight explosion. The bank’s cash machine survived intact and the suspected thieves are not thought to have made away with any money, Germany’s Welt Online reported. No-one was injured, though the blast damaged nearby cars and buildings. 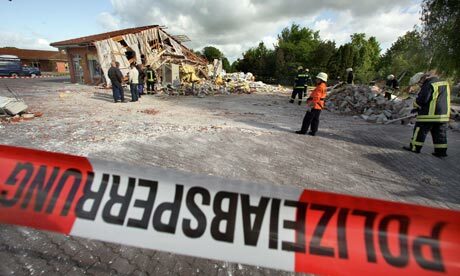 Investigators were working on the assumption that robbers had placed their explosives, possibly made from petrol or acetylene, at the entrance to the bank, German broadcaster NDR said. The presence of a delivery van near the site of the explosion indicated that the suspected thieves may have intended to drive off with the cash dispenser, local media reported. Posted by btx3 on May 26, 2010 in Nawwwwww!